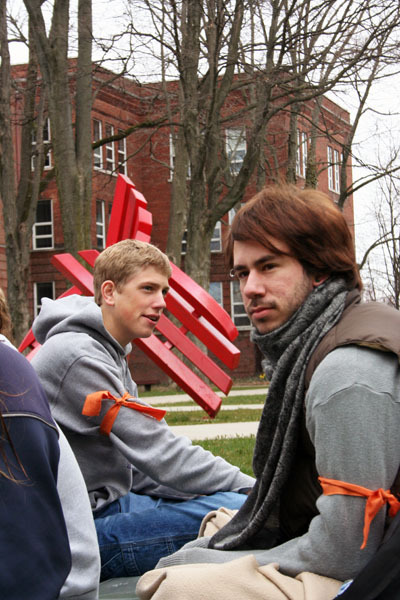 Chet Franklin (right) and Billy Funk helped organize the silent vigil in protest of Goshen College's discriminatory hiring policy. Photo by Trisha Handrich. A crowd of nearly 100 people gathered next to the broken shield in front of the Administration building on Wednesday to join in silent objection to Goshen College’s policy against employing openly L.G.B.T.Q. faculty and staff. The silent vigil was meant to raise awareness of the lesbian, gay, bisexual, transgender and queer community. The event was an informal student initiative, unaffiliated with any campus clubs. Joanna Landis, Chet Franklin, Piper Voge and Jessica Bubp, all seniors, organized the vigil, with help from several other students. “It was interesting to see faculty and administrators walking by,” said Charlotte Barnett, a sophomore. Some of them, she realized, would support the college’s current policy and would object to hiring L.G.B.T.Q. faculty and staff.